Here’s what Wikipedia says about the little village of Kyquot: The Kyuquot/Cheklesath First Nation (officially Ka:’yu:’k’t’h’/Che:k:tles7et’h’ First Nation) is a First Nations government based at Kyuquot, located on the outer coast of Kyuquot Sound, on the west coast of Vancouver Island in British Columbia, Canada. It is a member of the Nuu-chah-nulth Tribal Council. 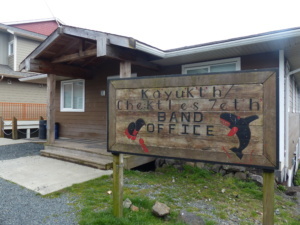 Before 1951, Both the Kyuquot First Nation and the Cheklesath First Nation were separately managed and funded by the then Department of Indian and Northern Affairs. The Cheklesath were very few in numbers and were not receiving adequate funding [for housing and infrastructure] from the Federal Government’s Department of Indian and Northern Affairs (funding based on Band Membership). The Chekleset chiefs and elders met with the Kyuquot chiefs and elders to ask if their people could live amongst the Kyuquot people. The Kyuquot chiefs and elders agreed to allow the Cheklesath to live on Č’axwataqt(Mission Island), but were not granted any rights in Kyquot affairs. They remain a separate nation until conditions warrant their return to their own territory. Here is what the Canadian Encyclopedia says about Kyquot: The Kyquot/Cheklesath First Nation, located on the outer coast of Kyquot Sound, on the west coast of Vancouver Island in British Columbia, Canada. As of 2015, the two nations have a combined membership of approximately 600 people, about 150 of whom live on reserve. Like other Nuu-chah-nulth nations, the Kyquot and Checleseht have a strong ceremonial culture, characterized by feasting and entertainment with song, dance, contests and theatricals. They are also known for their stunning woodwork, including canoes, totem poles, multifamily houses and other products hand-crafted out of fine cedar, such as baskets. The new project to build a Community Centre with W2R will include a Big House and perhaps a museum for visitors and tourists. 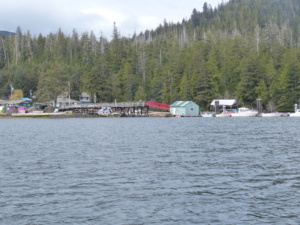 At present there are no tourist attractions but fishing charters, water taxis and bed and breakfast accommodations can be found through the band office.